I’ve been on a frame material kick lately and came across this concept bike that is being pushed into production. As an avid rider, whenever I think of the perfect frame I think of something light, strong, slightly flexible and durable (doesn’t break easily on impact). Steel is a good fit for these qualities and has sufficed for me in many of the bikes that I have ridden over the years. Carbon has its place and aluminum has done a good job at proving that it has a (rather large) spot in the frame industry. But what happens when something truly unique comes along? The picture that you see above is the new Clarity Bike designed by designaffairs STUDIO. 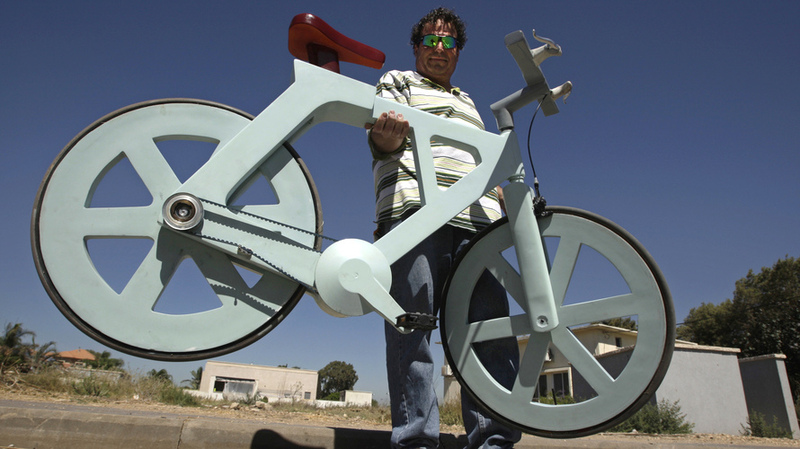 It’s a bike frame made completely from plastic. The original polymer was developed for military use and has some surprisingly good specifications for a bike application. Impact strength is continually mentioned first on their blog. I find this interesting as a first mention instead of strength. They are not the same thing! This is a critical point for a frame material. In fact, reading through the post, I don’t see any mention of strength. Impact strength in bike frame materials is a good specification to have highly rated. No one wants a cracked frame. They mention that it is ultra lightweight, but they don’t really give any hard numbers, instead merely mentioning that it has a lower density than polycarbonate or acrylic. Acrylic is less dense than polycarbonate (33 versus 34 lbs/cubic foot), so this new material is in the low thirties. Steel is around 150 which makes this material nearly 5 times less dense than steel. Not bad! Keep in mind that this frame is injection molded, however, and the volume of the material in the frame is going to be higher because the tubing will be solid compared to the hollow, extruded tubing you’re used to in bikes. If a bike were made of this material at some point in the future, you shouldn’t expect it to be 5 times less weight. designaffairs STUDIO mentions that the material has a ‘gentle flexibility’ to it and this is something that I appreciate as a regular commuter. I need my bike frame to give a bit rolling over the road. The cooler aspect of the potential of this material is the fact that you can just injection mold it. This opens up a surprising range of design options for frame designers. You can start integrating components into the frame or you can start adding modular systems to the bike to give it more functionality. Aerodynamics would be easy to just design into the frame and wouldn’t create a difficult manufacturing process. I think it is cool to see companies pushing the envelope with new materials and would be excited to see something like this make it to market. If you’re still digging the idea, check out the picture below. You can see the wall cracks continue through the frame. Neat! Revolights started as a Kickstarter campaign and has since gone into full production. The lighting system is a unique approach to providing your bike with side lighting to increase your visibility during night time riding. This is an inherent problem with night time biking. Typical bike lights focus the light that they are putting out front and back instead of to the side. Even if the light that you have has a design that allows light to come out the side, it is most likely a minimal amount. As unique of an approach it may be, I think that the current offering of reflective strips around tires may be a better option. For one, the reflective strips are offered on a fairly wide array of tires these days. This makes for a much less expensive solution to this problem. A bikers main concern at night is being hit by a car at night. The only way that I see a car not seeing you from the side with reflective strips is if they are driving with their lights off. Initially the Kickstarter project only allowed interested parties to purchase the entire set and Revolights are now offered separately as front and rear units. If you have some cash laying around and do a lot of night biking, you can pick up a single set for $139. This isn’t the only way of drawing more attention to yourself at night with LED’s on your wheels. If you’re looking for a less expensive alternative and don’t care about the clean lines of the Revolight, you may want to consider looking at the offerings of MonkeyLectric. They offer two alternatives in different varieties of colors for $75 and $50. For FAQS and additional information check out http://Revolights.com. Everyone needs some help now and then and the folks over at Made Good have your back when it comes to providing bike repair guides online. Featuring a comprehensive library of bicycle repairs, this is the place to go if you are in need of a great description of what to do. Not only that, they provide a walk through video and step-by-step instructions with images. The one thing that captured me was the simplicity in the entire site. They layout of the site makes it easy for you to find what you need quickly. Starting out, the bike that you see on the home screen allows you to click on a region of the bike (which then highlights) to take you to repair guides for parts associated with that region. You can of course search for a particular repair guide in if you know what you’re looking for. If you are in the mood for browsing, there are some popular repair guides displayed as well. There is a community section on the website too that allows you to connect to other users to ask questions or chat about the guides on the site. This section of the website is where the people behind the site hope to see users collaborating and contributing to the biking community. All in all, a very cool site that offers a lot of quality information. I would have loved to have this information when I was a kid!